Ben Feringa, Academy board member and professor of Organic Chemistry at the University of Groningen, has been awarded the Nobel Prize for Chemistry. Feringa has received this honour for building molecular structures that move in a controlled manner when exposed to energy. He shares the prize with Jean-Pierre Sauvage (France) and Sir James Fraser Stoddart (UK). According to the Nobel Committee, Feringa, Sauvage and Fraser Stoddart have shown how the miniaturisation of technology can spark a revolution. The laureates have designed molecular machines and in doing so have taken Chemistry into a new world. Molecular motors are expected to play a crucial role in the development of new materials, sensors and energy storage. Ben Feringa (born in 1951) studies molecular motors and other nanoscale machines. In 1999, he and his group created the first light-driven molecular motor capable of full rotation. Molecular motors make it possible to switch on an antibiotic remotely, for example, potentially allowing the drug to target only the relevant body part. In addition to molecular motors, Feringa works on catalysts that make chemical reactions more environmentally friendly. 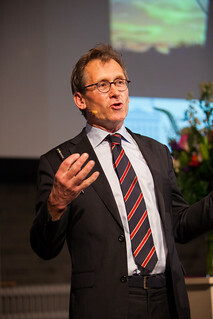 Ben Feringa received the Spinoza Prize in 2004 and has been an Academy member since 2006. He has won many prestigious awards, including the Arthur C. Cope Late Career Scholars Award 2015 (2014), the Nagoya Gold Medal (2013), the Marie Curie Medal (2013), the Humboldt Award (2012), the Chemistry for the Future Solvay Prize (2015), the August Wilhelm von Hofmann Medal (2016) and the Tetrahedron Prize (2016).